After opening its doors nearly two decades ago, MOJO Salon is thriving in its 16th year of business. Owned by Kasey and Alan Spengler, the salon is contemporary and friendly, providing cuts, colors, and Brazilian blowouts by appointment only. Their clientele is comprised primarily of regulars who feel at home after years of patronage. The open and welcoming kitchenette in the back is just as much the clients' break room as the four hairdressers’: Kasey Spengler, Danielle Johnson, PJ Wells and Phoebe Eskel. Despite our being new to MOJO, we were excitedly ushered in and made to feel right at home. Danielle Johnson, hard at work! Each of these highly professional hairstylists comes with a slightly different background. Kasey started her apprenticeship at Tosch on J and 26th Streets in the late eighties. One year later she opened her first salon on N and 28th. Danielle started as her assistant and a year later was operating as a stylist full time. They have been working side by side for 26 years. They both later moved to J Fontaine where they then met Phoebe. After a year all three transitioned over to the original Details Salon on 20th and Capitol where PJ later began working as a receptionist. With some encouragement, PJ went to beauty school and soon joined the ranks. Finally, in 1999 Kasey decided to open up shop over on J Street and the others came along. Since then, the four have had a very stable and familial working relationship, each with separate clientele. They serve clients from the entire Sacramento Region including Davis and the Bay Area. All are long-time customers. They estimate that 30-40% of their clients are male. MOJO Salon is located at 2318 J St. in Midtown Sacramento. Professionalism and attention to detail are always the priority. They strive for excellence with great attitudes and genuine smiles. Of course you’ll leave looking your best, feeling your best, and perhaps even with a bag of homemade cookies brought in weekly for sale by baker/caterer Amy Alfaro. It is a fun place, but also very polished. If you really take note, you’ll see the entire décor, wall color, furniture and artwork change every two years for a fresh start and new experience. One thing they would never change however, is their midtown location. It’s the crux of excitement and a place at once deeply familiar and yet always new. One of the things that the MOJO team loves about the job is the gratification of making people feel good. having the privilege of hearing abou t their lives and being a part of the community. Just after a client waves goodbye, Kasey tallies up the years she’s been cutting that same hair. For that happy client, it’s been since 1984. 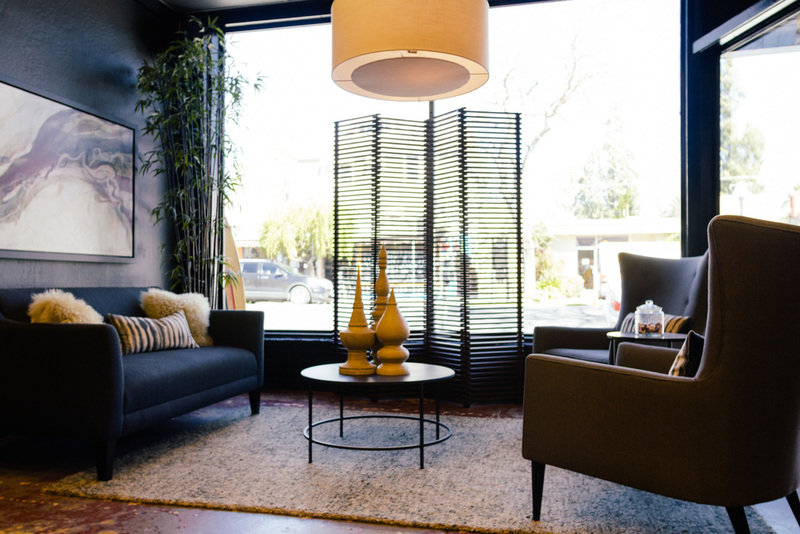 If you have any stories to share about salons in Sacramento, past and present, let us know! Also, our friends at MOJO Salon would love to hear from you!